This morning after doing a little research online I made my first attempt at trying to recreate the amazing White Chocolate Ice Cream from Berthillon in Paris. I use a recipe from jamieoliver.com and for the most part I followed the instructions. With the only difference being I used some homemade vanilla sugar instead of ½ a vanilla pod or vanilla extract. I did this because I don’t want a strong vanilla flavor in this Ice Cream. Also I strained my custard and white chocolate mix through a fine mesh sieve to ensure it was smooth. 1 Teaspoon Vanilla Extract or 1/2 a Vanilla Pod. Boil the milk and vanilla together in a pan until it starts to bubble gently, meanwhile whisk the egg yolks and sugar together. Pour the milk on to the egg mix and stir and then gently pour the mixture back in to the saucepan and simmer very, very lightly (or it’ll split). Stir continuously until the custard mix thickens or coats the back of a wooden spoon then add the chopped chocolate stirring until the heat melts the chocolate. Cool the mixture, put it in the fridge to chill. 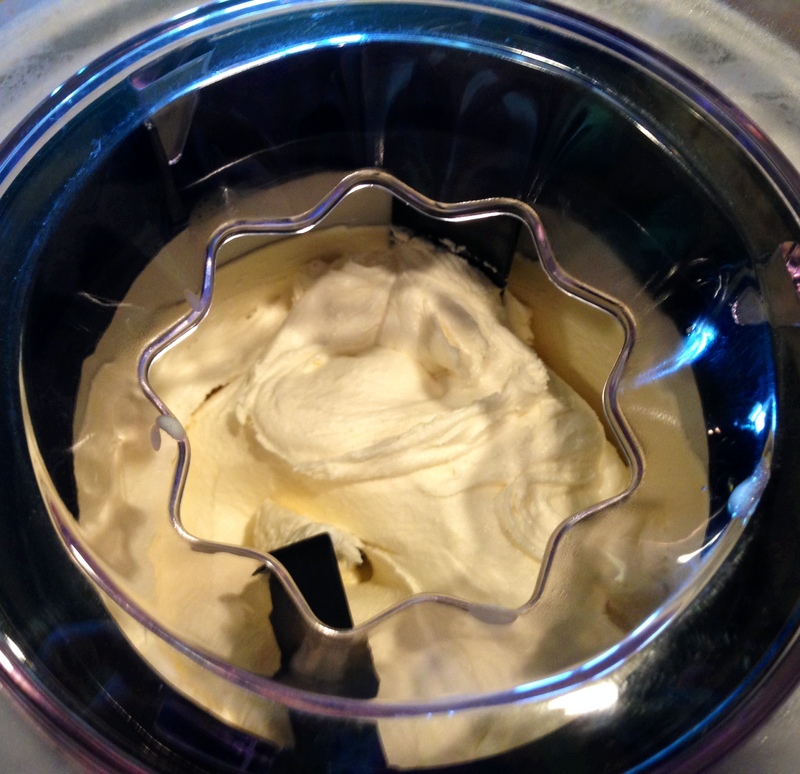 Once chilled, add the cream to the mixture (if you are not using an ice cream machine whisk the cream until stiff and then fold into the mixture). Pour in to an ice-cream machine-or set in a shallow container in the freezer, stirring every 30 minutes till set, approximately 3 hours. So far… the verdict is I’m not convinced and I had a few problems. First, I think is my fault. I used Ghirardelli white chocolate chips instead buying high quality white chocolate. I know that whole chocolate is better and that chocolate chips usually have stabilizers in them to keep them fresh, which can sometimes give a gritty texture and after taste. But I was hoping white chocolate chips would be different. Wrong. I don’t know maybe it’s all in my head but I though that the flavor of the white chocolate had a strange after taste and I can’t quite put my finger on what it is. Does anyone have any recommendations on a good quality white chocolate? Second, this only made maybe a pint of ice cream. If I’m going to all the trouble of making homemade ice cream I want more than enough to feed two people. Third, I think the custard flavor in this recipe is too strong making the ice cream too rich and heavy. Unlike the delicate white chocolate ice cream flavor from Berthillon it was ultra creamy with out being too rich. We will see if it improves after it firms up in the freezer for a few hours but I’m skeptical. My sister is coming over tonight to be my taste tester. I have such a perfect memory of this ice cream and I’m only hoping I can figure out a way to recreate it or at least come close to it. Then again if it were easy to recreate Berthillon wouldn’t be the Paris institution that it is. With that being said…. Does anyone have any recommendations? Other than flying to Paris just for ice cream?